Ford is leveraging its highly successful Ranger range with a new model Raptor. Aimed at the premium sector of the Ute market, the Raptor will compete against HSV’s SportsCat, HiLux Rugged X, VW Amarok Ultimate 580 and even the entry level RAM 1500 Express. Raptor allows buyers to have many of the extras that they often add on aftermarket, but with the integrated design and warranty of the original manufacturer. The Raptor has been highly anticipated, but how does it measure up. From the outside, Raptor is all about the look. However the look has a purpose, one of facilitating off road performance. The first thing that stands out is the aggressive grille with bold FORD lettering that defines the DNA. The second thing is the overall aggressive stance with off road tyres, higher ground clearance and wider track. Raptor runs 285/70 R17 BF Goodrich All Terrain KO2 tyres on some fairly stylish alloy rims. There is also the added bling, but with purpose. The front fenders are made from durable composite materials for adventurous off-road driving. Along with the 25W HID headlights with LED Daytime Running Lamps, the front bumper includes new LED fog lamps with air-curtain ducts, which reduce air resistance. The flared shape of the fenders have been designed to accommodate the long travel suspension and off-road tyres. Firstly the Raptor inside is Ranger through and through, with, again, more bling. Seating is performance styled with high side bolsters and more support for the back and shoulders. Electric seat adjustment for the driver and a manual lever controlled lumbar support allow the driver to find a good position. Seat fabric is a leather surround with an insert of ‘Technical Suede’ and blue highlight stitching that is actually quite comfortable. In front of the driver is a Raptor instrument cluster with a blue theme, two larger outside dials and a digital MFD between. It looks good and adds to the sporty ambiance. The steering wheel features perforated leather hand grip sections, paired with Raptor DNA lightweight magnesium paddle shifters. Regular readers will note my usual dislike of paddle shift changes, but these look cool, if unnecessary. The Raptor logo is debossed into the bespoke bezel of the steering wheel and an “On-Centre” marker – a red stripe at the top-middle of the wheel, which I actually like. If your wheel alignment is spot on, it is helpful in off road situations for wheel placement. Other than that the interior is as you would expect from say a Ranger Wildtrak. The centre console, transmission section is well laid out, with a padded console bin top. Centre stack is the same, with the touch screen now well integrated. Storage is adequate all round. Rear seat room is ok for two more than three, with, like most Utes, slightly limited knee and leg room for taller occupants. There are no A/C vents back there but a couple of 12V plugs for the kids electronic equipment. Raptor features an integrated 8 inch full colour touchscreen centre stack that is home for Sync 3 III. This is Ford’s system that now comes with voice control which can be a little temperamental. The system makes all functions available from the home screen which is split into 4 functions: climate, audio, phone and navigation, and has Apple CarPlay/Android Auto. The Raptor has Sat Nav with traffic management channel. The system has the unusual feature of allowing access to alternative screens from each screen making it easily navigable. The 6 speaker sound system belts out a good rock tune along with DAB audio. The Satellite Navigation System offers a “breadcrumb” feature to leave a trail in uncharted areas – perfect for the serious off-roader. Other features include an adjustable speed limiter, Electronic Automatic Temperature Control, Passive Entry Passive Start (PEPS), Auto lighting, Rain-sensing wipers, auto stop start and rear-view camera. Apart from the look the main story with the Raptor is the engine, suspension and drivetrain. Raptor features an all-new 2.0L Bi-Turbo engine that delivers power of 157kW @ 3750 rpm and torque of 500 Nm @ 1750 – 2000 rpm. This runs through an innovative 10 speed automatic transmission to extract the best from the engine. The engine offers both high performance and efficiency, thanks to its sequential turbocharging system that delivers performance when you demand. Ford says the Bi-Turbo engine has been designed from day one for some of the most challenging and stressful applications. Raptor has a dual range part time 4×4 with Terrain Management System. It also features a unique Transmission Calibration and “Live in Drive” Functionality, according to Ford. My take on this is that you can, like most drivers, leave it in drive and it will maximise performance for you. Two other key areas where Ford has made modifications to the Raptor are firstly the suspension. Front suspension is Independent McPherson struts with Unique Twin Tube Fox® Racing Branded shock absorber. Rear suspension is a Watts Link Rear axle with Long Travel Outboard Coil-over Dampers. Unique Twin Tube Fox® Racing Branded shock absorber with “Piggy Back” Reservoir. Secondly the brakes. Uniquely the Raptor has disc brakes front and rear, placing it amongst rare territory in Utes. The front twin-piston calipers have been increased by 9.5mm in diameter and feature ventilated rotors in an impressive 332 x 32mm size. Also at the rear there is a brake actuation master cylinder and booster to increase braking performance, as well as ventilated 332 x 24mm rear rotors and a new 54mm caliper. Driving the Raptor is very similar to driving any modified Ute with a lift kit and larger off road tyres, with more composure. Firstly the steering is slightly heavier with 150mm wider front and rear track and larger AT tyres. It’s not intrusive or difficult, but those drivers that are more attuned to standard Utes may find the steering takes a little getting used to. Secondly the 283mm of ground clearance combined with the heavier 285/70 R17 BF Goodrich All Terrain KO2 tyres means a few things, like the need to step up into the Ute more than standard, there is more road noise from the tyres and they feel different, harder, on the road obviously. None of this is bad, but you definitely know you are driving a modified Ute. Ford makes a lot about the desert or sand driving abilities of the Raptor. To this end the Ranger Raptor’s Terrain Management System (TMS) includes a unique Baja mode, inspired by Mexico’s famous Baja Desert Rally, and enables ultra-responsive, high-speed off-road performance. In this mode, vehicle systems like Traction Control are pared back to allow spirited off-road driving with less intervention from the vehicle’s on-board systems. Gear selection is optimized for maximum performance, and the mapping will hold gears longer and downshift more rapidly for even better response. In general off road conditions, the improved approach, rampover and departure angles as well as much improved ground clearance brings the Raptor in line with most aftermarket modified Utes running around. The AT tyres with rugged tread pattern boost the Ranger Raptor’s wet, mud, sand and snow handling ability. What sets it apart is the engine/transmission combination. The combination of the 10 speed transmission and twin turbo engine actually works quite well. In everyday driving it is smooth and responsive. Around town the higher number of gears helps with fuel economy as well as almost seamless shifts, increasing comfort. Off road it actually comes into its own. Like most off road driving, whether crawling over rocks, climbing sand dunes or racing through the desert, it all comes down to right foot control. The combination allows direct and immediate throttle control. It is also adaptive to the conditions. Unladen ground clearance is 283 mm. Approach angle is 32.5 degrees, rampover is 24 degrees and departure angle is 24 degrees. Raptor also features Unique Disc Brake system (Front & Rear) with integrated park brake, Electronic four-channel anti-lock braking system (ABS), with Electronic Stability Control (ESC), Electronic Brake Force Distribution (EBD) and Emergency Brake Assist (EBA) all operating through disc brakes front and rear. Ford Ranger Raptor Fit for Purpose. To determine the purpose let’s hear from Ford themselves. It’s designed primarily as an off road, specifically for sand driving, vehicle that still allows comfort on road. Essentially Ford has added a bunch of extras that buyers would normally add as an aftermarket modification to enhance the off road ability of their vehicle. Where the Raptor has the advantage is the engine and transmission combination and the integrated nature of the modifications. It is an awesome beast off road. It drives and rides better than almost any vehicle that has been modified aftermarket and compared to production vehicles only the HSV SportsCat comes close. Unfortunately and unusually the modifications have meant a reduced towing capacity which is a large negative. There is no denying the appealing appearance of the Raptor. It screams ‘look at me’ loud and clear. However it also has detailed functionality underneath. It is beyond all standard Ute capabilities and configurations. It competes with the top spec Utes and more with aftermarket modified vehicles. The benefit to buyers is that these modifications are integrated and covered by manufacturer’s warranties. However at this price point, buyers may expect a few more items they deem necessities like rear doff lock, electric lumbar support, heads up display and some safety features like AEB and more. It is pricey though and I suspect buyers will buy it for the look rather than actually make use of the capabilities. I predict that Ford will sell every Raptor they can lay their hands on. 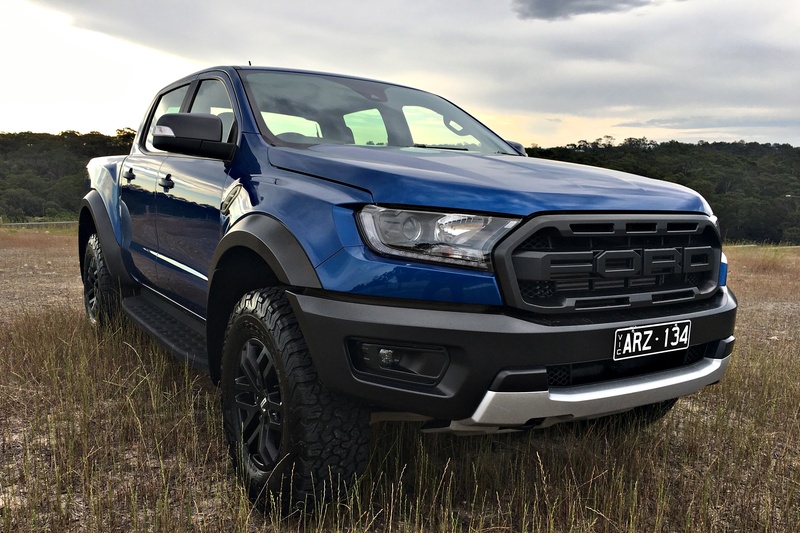 Ford Ranger Raptor – There is no denying the appealing appearance of the Raptor. It screams ‘look at me’ loud and clear. However it also has detailed functionality underneath.